Now is the time. Yes, I know, it’s time to party. But on a serious note, I would like to encourage everyone to put environmental awareness and innovation on their list of goals for 2009. Green regulation is no longer good enough. We need green innovation. We need to turn our green party into a green revolution. If not, everyone will suffer in ways that are not known by man. I came to this conclusion after watching The 11th Hour and reading Thomas Friedman’s Hot, Flat, and Crowded. Below is a video of Friedman talking about his brilliant book that offers solutions to the biggest problems facing mankind right now. The first chapter of Hot, Flat, and Crowded takes place in Istanbul, Turkey in 2003, where Friedman visited the American consulate, which was once located in the heart of the city. It is now in an Istanbul suburb. “It is a maximum security prison,” says Friedman. “San Quetin has nothing on it.” The consulate has 15-foot high walls, barbed-wire guard towers, and it is so secure they don’t even let birds fly there, hence the title of Friedman’s first chapter: Where Birds Don’t Fly. The third reason why America has lost its groove, Friedman says, is because “our government today cannot solve any big multigenerational problems. And whether it is called energy, environment, health care, social security, it just doesn’t seem to work anymore. It has to do with gerrymandered political districts, money in politics, 24-hour news cycles, and a permanent presidential campaign that have come together in a way to simply gridlock politics in Washington.” He goes on to say that America still has the best and brightest entrepreneurs, but today’s government is not nurturing these incredible ideas. He goes on to explain how and why government needs leaders who can make green cars and companies mandatory. Why? Because there are so many people in the world living like middle-class Americans that we are in essence killing the human species if we don’t make dramatic changes right now. According to Conservation International, we are now losing one new species every 20 minutes. The level of pollution is growing exponentially because cities like New York are becoming the norm in countries such as China, Qatar, and the United Arab Emirates. This is simply not sustainable for the next decade or further down the road. Despite the hole we dug ourselves into, humans still have time to dig ourselves out. Friedman calls the solution to the 5 challenges listed above as Energy Technology (ET). “It is very clear to me that the country that owns ET is going to have the most energy security, national security, economic security, competitive industries, healthy climate, and global respect. That country has to be the United States of America. 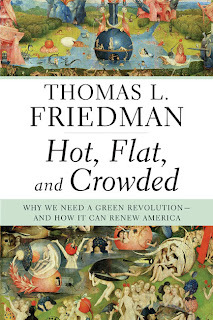 If it is not, the chance of our kids enjoying our standard of living, I believe, is zero.” Green will no longer be about electric power, but about national power because of the reasons Friedman mentioned above. “Green is the new red, white, and blue,” he says. Armageddon for the human species is here if we don’t dramatically change. It is no longer about conservatives and liberals. It is about survival of the human species. This is why I am urging everyone to have fun tonight, but to start making an environmental revolution in 2009. I aslo strongly believe in having only two children or less. With the world population rising so fast, a two-baby limit in a hot, flat, crowded world is something all young couples should follow. Most of all, I want to emphasize the power of awareness. Please tell your family, friends, and strangers about the need for massive green innovation, rather than just green regulation. Without it, we may not have many more happy new years.